Saturday night at the Antigonish Performing Arts Series started off well with a breathtaking performance from harpist Karen Rokos and flutist Patricia Creighton. The combination of flute and harp has captivated listeners for centuries. 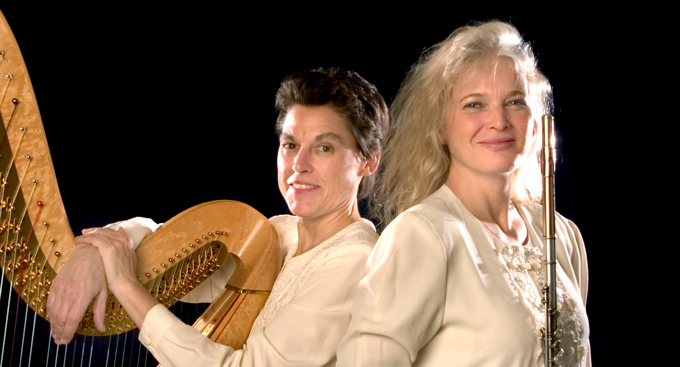 Bringing together two of the most ancient instruments, flutist Patricia Creighton and harpist Karen Rokos formed NOVA BRILLIANTE to be able to create soundscapes for listeners that would be provocative and beautiful. Both artists have professional and long-standing orchestral and chamber careers. Their recent disc “Melodies of Love” was a 2008 ECMA ‘Classical Recording of the Year’ nominee, and a 2009 MUSIC NOVA SCOTIA ‘Best Classical Album’. Their concerts are received enthusiastically. NOVA BRILLIANTE presents many different styles of music, from renaissance through baroque, classical, latin, modern, depending upon the needs of the concert presenter. Their presentation is artful, and totally engaging.